3 Where Was The Milk? Mr. Ivan Dunnett, 68, a retired stockbroker, lived at 12 Westbrook Avenue, a semi-detached house in the posh Murtonbridge suburb of London, England. He would have one pint bottle of whole milk delivered to him every morning at approximately 7:00am, by Andrew Wilston, a milkman. He would open the door at 7:13am every morning to claim his bottle of milky goodness. On Friday 6th October 1995 though, things were to go disastrously wrong. Mr Wilston was supposed to check in to his workplace, Murtonbridge Milk Supplies, at 5:15am, so he could set off delivering milk at 5:30am. At 5:25am on the fateful October morning he called his boss, Fred Thorax, to explain that he had a slight headache as a result of the below average temperatures recorded for the week previous to the incident. At 5:29am, Mr Thorax called Graham Terminal, a replacement milkman to come and do the round instead. At 5:49am, Mr Terminal arrived and at 6:13am all the milk had been loaded into the milk float and was ready to be delivered to all 62 houses on the round. Mr Terminal set off at 6:15am, 45 minutes later than usual, to deliver the milk. As a result of the delay, Mr Dunnett went outside at 7:13am to find that no milk was there. Slightly confused, he rang up Mr Thorax at 7:15am and the situation was explained. Mr Dunnett could expect his milk to arrive at 7:58am. At 7:57am, Mr Dunnett opened his front door and waited for his milk to arrive for 5 minutes. What happened in those 5 minutes is a mystery. At 8:32am a concerned old lady who just so happened to be passing by thought that something didn't feel right and wandered inside 12 Westbrook Avenue to find Mr Dunnett sitting at his kitchen table in a state of shock with a bowl of cornflakes, minus milk, on the table in front of him. Mr Dunnett was slightly hungry. Part of the map provided by Mr Thorax for Mr Terminal. Mr Dunnett's house is circled. Mr Terminal was arrested and brought to Murtonbridge Police Station for questioning at 12:37pm, almost two hours after he had completed his job and checked back at Murtonbridge Milk Supplies. He was released three hours later on bail. Recordings of the police questions were never made public but Mr Terminal claimed that he had delivered all the milk he was supposed to at the correct houses. Indeed, all of the other people due to receive milk on that fateful round actually confirmed that they had received their milk, including Beatrice Greenwood, Martin Byrd and Frances Reed, who resided at 4, 5 and 18 Westbrook Avenue respectively at the time. From this evidence, it would be unclear as to whether the milk was delivered at all to Mr Dunnett's abode. But on Sunday 8th October 1995, some startling new evidence emerged. Across the road at 9 Westbrook Avenue, home of Mr and Mrs Barrow, at 8:13am on the fateful morning, a CCTV camera was being fitted for security reasons, as they had had a piano stolen from their house a week earlier. At 8:17am the CCTV fitting people recorded a few seconds of test film. Then after finishing at 8:23am, they started recording again. The evidence showed that at 8:17 there was a full milk bottle present but by 8:23 it had vanished. Mr Terminal was cleared of all charges immediately, as he had done his job of delivering the milk and was innocent. Dudley Durwick, the man who had been paid by the Barrows to fit the CCTV was questioned by police, to see if he knew anything about the whereabouts of the milk but it eventually transpired that he couldn't have seen anything, being blind and deaf. For some reason unbeknownst to everybody, the CIA seized the CCTV footage and released just two frames, the ones you see above, to The Sun newspaper. Certain groups have speculated that the two frames have been doctored using a high-tech picture hacking program such as MS Paint. The Sun took it upon itself to start a campaign to help find the milk, in the interests of the British Public. On Monday 9th October, The Sun ran a front-page story on the shocking news and the campaign. By the next day, 4 million members of the public were backing the campaign, as were celebrities such as Jade Goody and a Bono look-alike. By Friday 13th October, Phil Collins, the drummer from Travis, that guitarist who sometimes plays live for S-Club and that bassist from Swedish black metal band Fyrnschythe had recorded a single for the campaign. '(Where was the) Milk (when I needed it?)' made number 2 in the charts and raised £300,000 for the campaign. Hours after reaching number 2, The Sun was due to congratulate Mr Collins for all the hard work he had put into the campaign but unfortunately he was unavailable for comment and was seen driving off in a real nice new expensive car. 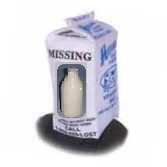 An American milk carton showing a picture of Mr Dunnett's missing milk bottle. 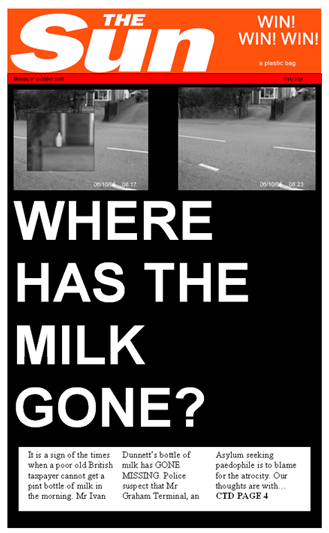 The missing milk campaign even spread internationally. Pictures of Mr Dunnett's missing milk bottle were soon to appear on the sides of milk cartons on breakfast tables all over North America, while the milk bottle's image was also displayed in post offices in all fifty states. The popular national weekly tabloid newspaper, the National Enquirer, even ran a front page campaign that paralleled the one mounted by The Sun back in the U.K. which its huge readership responded to in droves. Speculation that the missing milk bottle had been abducted by aliens, or stolen by Elvis while he was on a secret visit to London, was rife. By now, everyone was really confused. 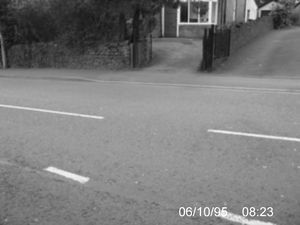 It appeared that in the 6-minute timeframe between the two pictures taken by the Barrow's CCTV camera, the milk had vanished off the face of the earth. On Sunday 15th October, a person who was walking their dog came across what looked like a bottle in the middle of a field in the country. Police rushed to the scene and sealed the area off while the bottle was removed for forensic testing. It then emerged that the bottle had actually contained beer and was nothing to do with the missing milk. The Sun's campaign raised £37 to help Mr Dunnett's milk delivery arrive promptly and on time. There are many conspiracy theories surrounding the events. A few people have noted the coincidental numbers involved, for instance, Mr Dunnett's milk was supposed to be delivered at 7am, Mr Dunnett's age at the time was 68, (6 + 8) / 2 = 7, it all happened in 1995, 6 years before 9/11 happened, 6 + 1 = 7. The number coincidences are many. One theory is that Mr Wilston didn't arrive to work that day intentionally, knowing that the round would then start later than planned and then stealing the milk. This theory hasn't been proven. Another completely ridiculous theory is that Mr Dunnett consumed the milk and pretended that it had gone missing so that there would be a huge campaign and he would get money. This theory is total rubbish. This page was last edited on 17 October 2015, at 10:58.